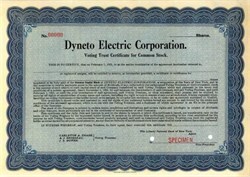 Beautifully engraved SPECIMEN certificate from the Dyneto Electric Corporation. This historic document was printed by the American Banknote Company in 1918 and has an ornate border around it. The Dyneto Electric Company was formed in Elbridge, New York. The company made starter-generator (single unit) systems for cars among other products. One of the company's early customers was Louis Chevrolet for generator, ignition and lighting systems for his Chevrolet cars.